Residents of Crayford (DA1), are you tired of carpet cleaning companies promising much and not delivering on those promises? We at Magic London Carpet cleaning in Crayford (DA1) are here to provide you with quality carpet cleaning services. We are your neighbourhood “one stop” for carpet cleaning, rug cleaning and upholstery cleaning.Just call us now 0208 861 0979 for more information and estimate prices. Just call us on 0208 861 0979 for more information. Our company is equipped with a fully trained, experienced and qualified staff using the latest machines, equipment and techniques. We provide excellent professional service unparalleled within the cleaning industry. Magic London Carpet cleaning in Crayford (DA1) will leave you satisfied with your dry carpet cleaning, steam cleaning of all your rugs, carpets and upholstery looking fresh, feeling clean and fresh smelling. If you are not satisfied by the result, we will reclean for free. Don’t hesitate to book our professional services. 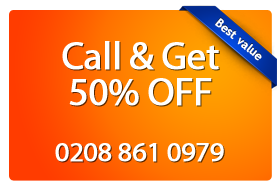 You can call on 0208 861 0979 , or use our on-line booking form anytime. Our customer support ladies are ready to reply to all questions you have about our services. If you supply us with additional information about your home dimensions, you will receive free price estimate.